I recently got my hands on a new book called The Global Bakery: Amazing cakes from the world’s kitchens by Anna Weston. The book runs the gamut from simple to elaborate cakes, and is divided into different regions of the world. I really enjoyed taking the world tour of cakes, and I think that the recipes seem authentically sourced. I saw some I knew and discovered quite a few that I had never heard of, such as Cornmeal Cake from Zimbabwe, and Melaxrini, an eggy cake from Greece. There are a few I was interested to try, one of which was Castagnaccio, a beautiful tart from Italy that combines chestnut flour, sweet wine and olive oil. As much as I wanted to try this one, I could not find chestnut flour, and so I’ll have to wait until I can order some online for that one. A Palestinian Almond and Citrus Olive Oil Cake also sounded divine and very simple. But I finally settled on the Spiced Coffee Sponge Cake from Colombia, and I was not disappointed. This coffee cake is not only for eating alongside coffee- it features coffee in both the cake and the icing. 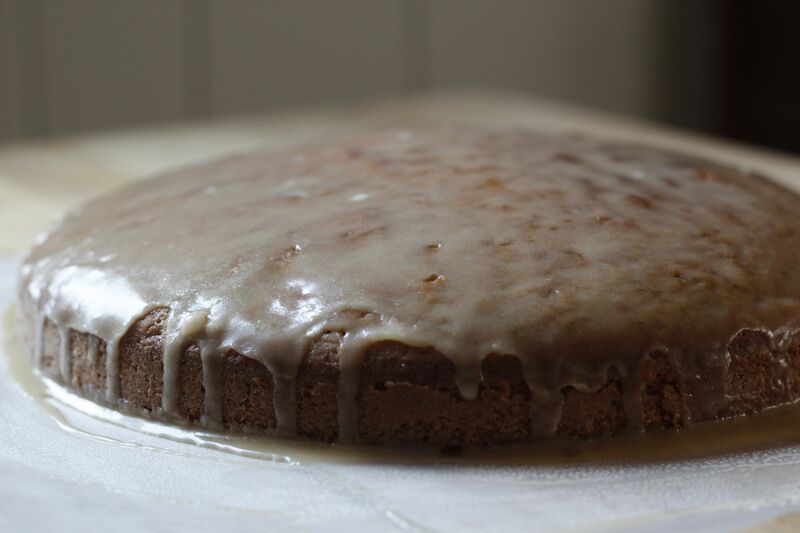 The combination of fresh nutmeg, cinnamon, clove and coffee makes a wonderfully fragrant cake with a rich, roasty flavor. Using coffee instead of other liquid in icing is also a great trick; I love the way it preserves the roasted coffee flavor that sadly dissipates so quickly in brewed coffee. I modified the icing quite a bit, however, both because of my kitchen constraints and because I wanted to lighten it up just a bit. I simply mixed coffee, confectioner’s sugar, a small amount of butter and vanilla extract. The result was more of a glaze, which suited me just fine. For a richer cake, try the full recipe. I also only used one pan, instead of the two layers recommended in the recipe. My cake came out a bit denser than what I would call a sponge cake, but then again, I am baking with a toaster oven, and without electric beaters, which are packed away until the new kitchen is done. Grease and flour 2 8-inch round cake pans. Heat the oven to 355 F.
Combine the coffee and milk in a saucepan and bring to a boil. Then allow the liquid to stand on a low hear for 10 min. Strain the mixture through cheesecloth or clean tea towel (or tea strainer) into a small bowl. Return the coffee flavored milk to the saucepan and keep in warm over low heat. In a bowl, sift the flour, baking powder, salt, cinnamon, nutmeg and cloves. Set aside. In a large bowl, beat eggs until they thicken. Slowly add the sugar, continuing to beat well after each addition. Add the coffee-flavored milk and vanilla, stirring until just blended. Fold the flour and spices into the mixture until just blended, taking care not to overheat. Fold the melted butter in carefully. Pour the batter into the pans. Bake for 20-25 min or until a skewer inserted in the middle comes out clean. Allow the sponges to cool for 10 min, then turn them onto racks so they can cool completely. To make the frosting, combine the coffee, sugar, salt and egg yolks in a heat-proof bowl. Over simmering water, beat the ingredients until the mixture has thickened. Remove from the heat and continue to beat until the mixture has cooled. Add the butter one tablespoon at a time, beating well after each addition. Add the vanilla and continue to beat until the mixture is thick enough to spread. When the cake has completely cooled, spread the frosting over one layer and place the other layer on top. Cover the cake with the remaining frosting. If you are looking for historical background on world cakes, this is not really it. The explanations are brief and it seems that Weston’s goal was mainly one of searching for deliciousness in every corner of the world. (A noble pursuit if you ask me!) I also appreciated the occasional blunt assessment of an exotic recipe, such as her admission that the Chinese Sweet Potato Cake, “kindly” shown to Weston by a couple of Taiwanese students, “didn’t meet with universal acclaim from my colleagues when I brought it into the office.” Ha! Poor kids. But if you are curious about how different cultures celebrate with cake, Global Bakery is a really nice introduction, with great photos and lots of good recipes to try. The Global Bakery by Anna Weston, New Internationalist Publications, 2014. Mmmmmmmm. Looks great. By the way, there was a piece on NPR about a writer named Laurie Colwin who wrote a book “Home Cooking: A writer in the Kitchen.” i will try to find it for you. Next Next post: Happy Chanukah!